Is it just me or does the tail tank and cockpit area look odd? It doesn't look right. But maybe it's just the picture. I think your right, Webbie. It looks a little looonnng to me. Or the seat back is too far forward. While I appreciate the effort they put into this collectible, you are going to need to be way more accurate than that to squeeze me for nearly a thousand dollars. Somebody screwed up taking measurements! Kurtis Kraft frames were not that elaborate. It doesn't appear that these cars are assembled like a full-scale car either. I've got some other photo's of this die cast, I'll dig them up and post later, but I can tell you that for the size and money, it's not even close. The tail is a total mess, not close to a Kurtis or decent Kurtis copy, the hairpin radius rods are too thick, and not the right size and shape, the pitman arm and drag link is too bulky. The rear nerf bar is completely wrong. I've always felt if a company is going to the time and expense to do a large scale replica, and charge a lot for it, it should be damn near perfect. Franklin Mint did the Agajanian #98 Kuzma champ car, the one that Troy Ruttman won the 1952 Indy 500 in, they produced it in dirt trim at 1:16 scale, and it's nearly perfect. 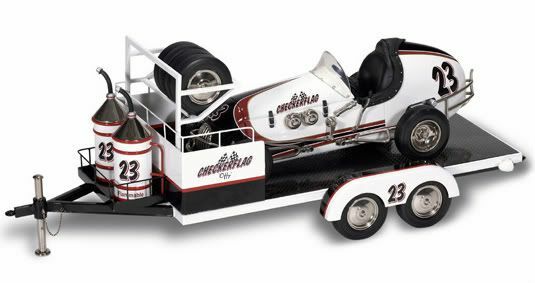 In my opinion it's the finest die cast replica of any American oval track sprint, midget, champ car produced. And it was only $145. Franklin Mint did the Agajanian #98 Kuzma champ car, the one that Troy Ruttman won the 1952 Indy 500 in, they produced it in dirt trim at 1:16 scale, and it's nearly perfect. In my opinion it's the finest die cast replica of any American oval track sprint, midget, champ car produced. And it was only $145. GMP's Agajanian 98 went into so much detail the gas pedal is identical to the full-size car.